Parents contributing to a 529 college savings plan may find it difficult, if not a little time consuming, to transfer cash and checks that their children receive on their birthdays, Christmas and other celebrations into the popular college savings fund. Instead of not knowing if their cash gift is going to pay for college or for a night out on the town, grandparents and others can now buy gift cards and have the money deposited in the student’s college savings plan. The 529 gift cards are available nationally at Toys “R” Us and Babies “R” Us retail stores and are used at Giftofcollege.com, a registry for online gifts to 529 accounts. Some of the gift cards promote a specific state plan, but all of them can be redeemed as a deposit into any state’s 529 plan. 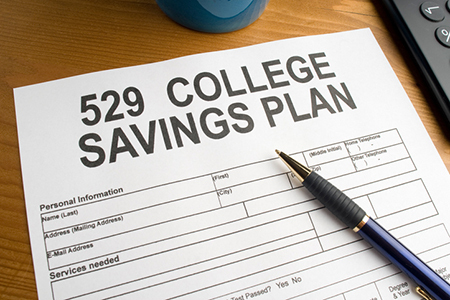 A 529 plan is a state-run program for families to invest in for college expenses. The money grows tax-free and can be withdrawn tax-free to pay for education. Contributions aren’t deductible from federal income taxes, but many states allow the deductions on state returns. Electronic gift cards for 529s are also available at the Gift College website, though buyers may find it more fun to buy a physical gift card at a store. The 529 gift cards come in fixed amounts of $25 or $50, and in variable amounts up to $500. Recipients must create a profile on the Gift of College website to redeem the card and have the money put into their 529 plan. If they don’t yet have a 529 plan, their parents must first create one for them in order for the money to be transferred. The Gift of College cards carry a fee of $3.95 to $5.95, depending on the card’s value, and it’s paid upfront by the buyer. There is no fee for redeeming the card, so a $25 card will equal a $25 deposit to a 529 plan. To avoid paying the fee, givers can obtain the child’s 529 account number and send a paper check directly to the plan with the 529 account number on it. Some plans also allow direct online gifts, though parents have to initiate the transaction.